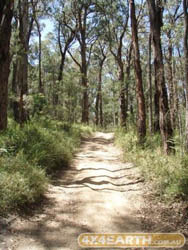 Easy track in Bunyip State Forest. Leads to a nice open area with some large boulders and a scenic view along the High Tension Powerlines. NB. Do not head north as in the GPS track, we thought the track headed that way, but leads to a moderate incline with steep ruts. The Patriot need a good kick to get up there and it definately isnt an easy track.